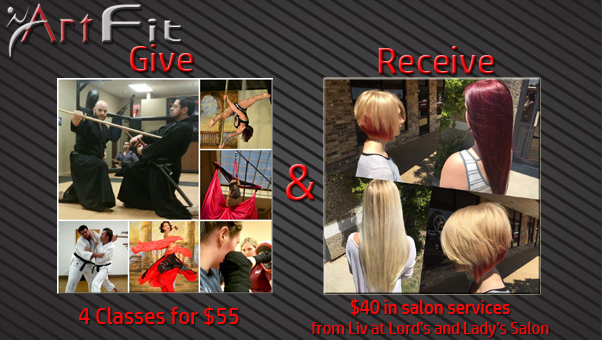 Give one ArtFit gift certificate of 4 classes and receive a gift certificate for $40 worth of services from Liv at Lord’s and Lady’s Salon for $55. Thank you so much for giving the gift of fitness this year. We want to thank you by giving you a gift certificate for salon services with Liv at Lord’s and Lady’s salon. Because we are offering such an awesome special, ArtFit gift certificates can not be used by current members, but we hope you will enjoy the salon gift certificate. Both certificates will be emailed to purchaser. Please message us if you prefer to pick up a printed version at ArtFit. Please contact Liv for salon appointments. 806-549-7081 or on Facebook @ Liv’s Locks and Liniments.